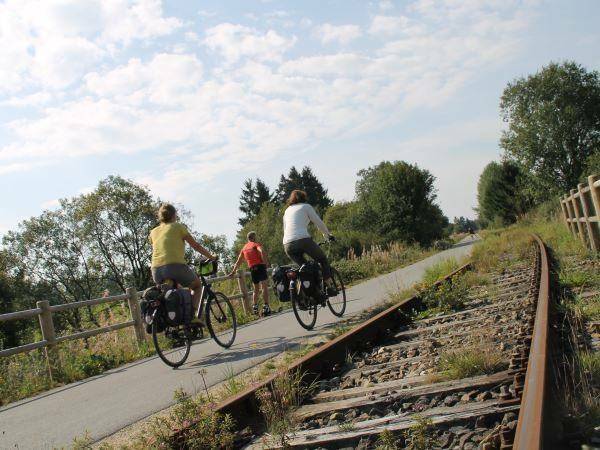 The Vennbahn rail trail is a 125km long cycle path on a former railway leading from Troisvierges in the north of Luxembourg along the scenic River Our to Belgian-German High Fens-Eifel nature park. The Vennbahn finishes in the historic German city of Aachen, a town of great significance, as the cathedral and gothic Town Hall testify. The maximum average incline on the route is 2% and is ideal for a leisurely cycling holiday. Make your own way to Maastricht in Limburg province, in the farthest possible corner of the southern Netherlands or Gravenvoeren, Belgium. Maastricht is easy to reach by public transport as it is only 2 hours by train from Amsterdam and 1 hour from Eindhoven. For those of you arriving by car, there is parking at the Hotel. You will be welcomed with coffee/tea and “vlaai”, local fruit tart. It’s only a short ride from Maastricht to the border with Belgium. Past 's-Gravenvoeren,and Hombourg you cycle to Raeren, where in a Castle a pottery museum is located. 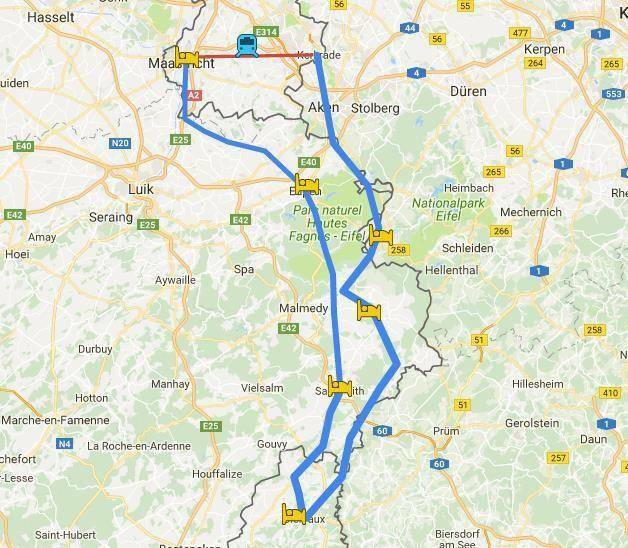 Continue your route to Eupen, the capital of the East Cantons. Enjoy the last 7 kilometres of today’s route ‘downhill’ direction Lake Eupen! Remarkably, nearly all of today’s route is closed to motorized vehicles. Climb gradually to a height of 660m above N.A.P. level, enjoying the natural beauty of the High Fens. From Kalterherberg on, the route follows the ‘Vennbahn’ cycling path. It’s an easy ride past Sourbrodt marshalling yard to Waimes; and then past Montenau artisanal ham smokery to Sankt Vith. On the way to Luxembourg, still on the ‘Vennbahn’ cycling path, don’t miss the castle ruins of Burg Reuland. Shortly after, cross the border into Luxembourg to reach Troisvierges. At this point, choose either to catch a slow train to Clervaux or to cycle a splendid route with some stiff climbs and delightful descents! On your final cycling day, head back from the centre of Monschau to the Vennbahn rail trail. A visit to the monumental town of Kornelimünster is a must. After a long descent you will reach the town of Aachen, once the centre of Charlemagne’s empire. After your visit to this historic town, get on a train to Maastricht; relax and enjoy while the hills of scenic southern Limburg glide by like a protracted panorama. End of tour. Departure after breakfast. The Vennbahn rail trail uses the route of a former railway line crossing three countries over 125 km. The maximum average incline is only 2% and so the route is suitable for cyclists of any level. We recommend flying to Cologne, Brussels Zaventum or Brussels Charleroi airport to reach the starting point of this cycling holiday. TRAVELLING BY TRAIN FROM KERKRADE TO MAASTRICHT-RANDWYCK At day 7 of your cycle holiday, you cycle from Monschau (D) to Kerkrade (NL). The route leads you to the railway station of Kerkrade-Centrum (Kerkrade is a former centre of the Dutch mining industry). From here you travel by train to Maastricht-Randwyck. The departure times are: every hour at (e.g.) 14.00 hrs. and 14.30 hrs. Arrival in MaastrichtRandwyck 0.42 hrs. later, with 1x change in Heerlen!! – from platform 2 to platform 1. Please note: platform 5 is just opposite platform 4, that’s easy! Example! Departure Kerkrade-Centrum : 14.00 hrs. Arrival Heerlen : 14.14 hrs. change from platform 2 to platform 1 Departure Heerlen : 14.16 uur Arrival Maastricht-Randwyck : 14.42 uur ON PUBLIC HOLIDAYS AND IN JULI / AUGUST DON’T TAKE THE TRAIN OF 16.30 HRS. – A CHANGED TIMETABLE IS THAN APPLICABLE! ATTENTION pls. : Bicycle transport in the train is not possible from Monday to Friday during rush hour between 16.30 – 18.00 hrs. Therefore, if you travel e.g. at 15.30 hrs. to Maastricht-Randwyck or previously, above measure does not apply to you! On Saturday, on Sunday, on public holidays and in July and August, bicycle transport is all day allowed. THE TRAIN TICKET (S) FOR THE TRANSPORT OF YOURSELF + FELLOW TRAVELER (S)+BIKE(S) YOU’LL FIND IN THE TRAVEL DOCUMENTS. The Vennbahn Rail Trail cycling holiday includes the daily transfer of luggage to the next hotel and local support if required.